In the pop-up window that appears, enter either your Facebook details or your Spotify username and password in the fields provided and click Log In. Alternatively, in the Spotify application, click your username at the top-right of the window and select Account from the drop-down list that appears. You come to a web page promoting Spotify’s different products. Click either the Get Spotify Premium or the Get Spotify Unlimited radio button, below the appropriate product description. Alternatively, go directly to Spotify Premium to upgrade to either a Premium or Unlimited account. Your subscription choice is highlighted. Note that if you have a Premium gift code, you won’t need to enter your payment details — just select the I Have a Code option. Scroll down the web page and select the radio button for your payment method. Choose either credit card or PayPal in the Select a Payment Method section. 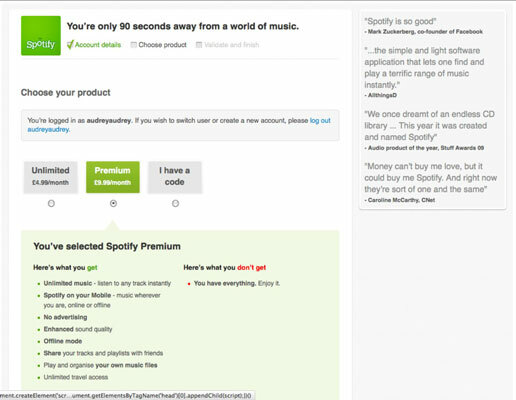 Select the I Agree with the Spotify End User Agreement check box. There’s a link to this agreement, so you can read it before continuing. On the page that appears, review your purchase and enter your credit card details in the appropriate fields. Remember, you’re confirming a recurring monthly payment. In the fields provided, enter your credit card number, its expiration date, and security code (the last three digits on the back of your Visa or MasterCard, or the four digits on the front of your American Express card). Click the Confirm Payment button to finalize the process. If you want to cancel your subscription, you can find a link to do so on your subscription page.